The battery capacity is 3000 mAh, this is 50% more than that of the original BP120. As a result, the instrument-user will benefit from a much longer 'up time' than with the original NiCd battery, at the same volume and weight. The BP120MH replaces the earlier models BP120 and BP130 alike. Battery pack as replacement battery in the Fluke 120 series ScopeMeters test tools and in the Fluke 43 and 43B Power Quality Analyzers. 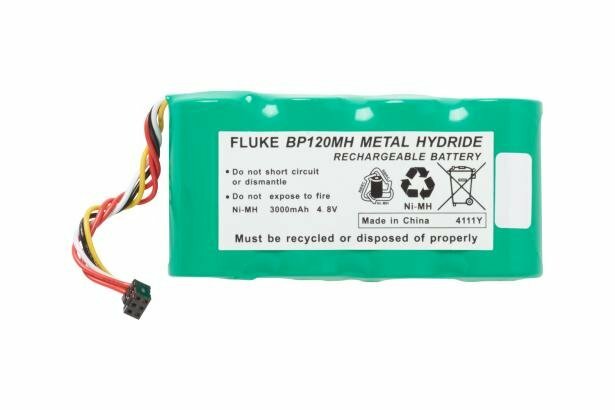 The BP120MH is a Nickel-Metal-Hydride Battery Pack, made specifically to support the ScopeMeters test tools and Power Quality Analyzers mentioned.